Once more, Marc Fosh Catering and its team exceeded themselves and surprised their guests again. The occasion was even more special, as long as it was the wedding of Kevin Becker, Marc Fosh Catering’s Manager. The engagement took place at the spectacular estate of Son Mir, located just 10 minutes from Palma. 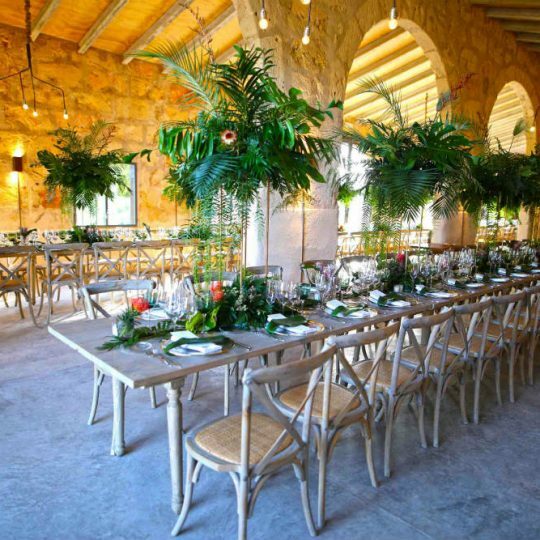 This is an estate with history and tradition in Majorca, as it dates from the 17th century, and serves as an unparalleled setting for the celebration of such an important day, as a wedding is. the bindweeds in the estate. A typical Majorcan windmill witnessed the emotional “Yes, I do” from the couple, amid the estate’s “marjades” (terrace gardens) and before the eyes of their loved ones. An extension of orange trees and vines full of grapes was the setting of the event. Marc Fosh Catering matched with the environment and the event, offering a high quality menu, with fresh products, to the delight of the guests. Once more, the whole Marc Fosh Catering team proved why they are a model in the gastronomy sector, offering first-class serving. As starters, we must highlight the smoked eel in saffron, served with fries, artichokes and truffle or the marinated sardine toast. The main course consisted of an exquisite deer sirloin with black pepper, brined plum and “topinambo” purée, and as second course, a suckling pig terrine with foie and crusty pear. An interesting mixture of flavours, with the sea and the mountains always present. These courses were presented in a modern and innovative design, playing with textures and making the menu an absolute pleasure for the senses.